It is the duty of every Buddhist to pay homage to the Buddha before the commencement of any Buddhist recital. The following sentences in Pali should be recited thrice and only after that does one take refuge in the Triple Gem. 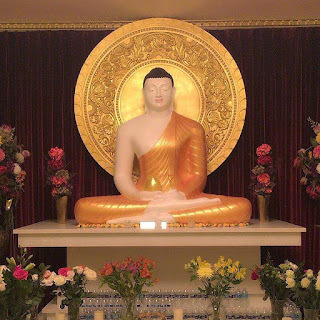 This is done only as a mark of respect for the great virtues and wisdom of the Buddha in order to gain confidence, devotion and inspiration in the Buddha. However paying homage in front of a Buddha image or statue does not mean that we worship that idol. It is only a means for us contemplate to contemplate on the great of virtues of the Buddha. We respect and and be grateful to those noble qualities of our Teacher. The greatest respect or homage or salutation to the Buddha, Dhamma or Sangha is to follow the noble Path.